Google said its vehicles had been involved in only 16 minor incidents during six years of testing, with humans in other cars to blame. "We've seen in our own testing that drivers can't be trusted to dip in and out of the task of driving when the car is encouraging them to sit back and relax," said Mr Urmson. 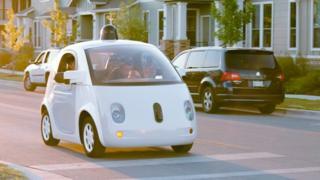 However, the technology is still being improved and in November, one of Google's cars was pulled over for driving too cautiously. Some of the driverless cars Google has been testing in California do not have any manual controls such as steering wheels or pedals. The DMV's draft regulations would prevent residents from riding in those vehicles until their safety could be assessed in "subsequent regulatory packages". "The draft regulations are designed to address complex questions related to vehicle safety, certification, operator responsibilities, licensing and registration, privacy, and cybersecurity," the DMV said. A public consultation on the draft will take place in the new year. On Tuesday, car giant Ford announced it had obtained a permit to start testing driverless cars in California. Its vehicles retain manual controls for humans to take over, as required in the draft regulations.